On June 20, 2004, Jordan Peters and I climbed a new route on the West Face of Cutthroat Peak. The route (III 5.8 X) begins on the west face below a dihedral system and goes for six pitches, with climbing up to 5.8. One pitch (5.8 X) was unprotectable “cutthroatmeal,” which loosed a block that exploded inches from the belayer. Another pitch required stemming high above a gully. The rest of the climbing was quite enjoyable and exposed. The route ends at the top of the second southwest gully, as the climb trends rightward, avoiding large, blank headwalls and gullies. I wouldn’t recommend this as a quality climb, thus the name. On June 22, 2004, I decided to climb and ski Mount Rainier from the summit again in one day, after having climbed the mountain two days prior. I had good weather, previous route experience, and motivation to want to ski something new... Who needs sleep? Instead of skiing the Emmons Glacier this time, I decided to add some spice by skiing off the ridge next to the Russell Cliff, which feeds into the Winthrop Glacier. Snow at 45-50 degrees with serious exposure presented me with a no fall zone for around 800 vertical feet. A fall in the wrong spot could result in rag-dolling over 1,000 feet. To ski fluidly is not an easy thing after climbing 10,000 vertical feet on no sleep. The snow on the descent was three to five inches of corn-like snow, though it had a loose feel to it and would slide each time I made a turn. The crux of the line was a mandatory straight-line run, stopping in time to avoid falling into a crevasse. 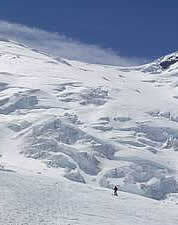 Once I finished skiing the steeps, I decided to ski the Winthrop Glacier. From 13,000 to around 11,500 feet, the surface was a combination of corn and wind-drifted snow, fairly smooth and made for good fast turns. Lower down, the snow turned to a foot of slop. Add the fact that crevasses were opening up and it made me a bit nervous. If anyone decides to ski this run, I recommend skiing it before 9:00 or 10:00 a.m. to avoid falling into a hidden crevasse. On June 27, 2004, Eric Wolf and I climbed a new route on Dragontail Peak. The route (IV 5.10b R, 14 pitches) begins below an obvious dihedral just uphill of the Northeast Couloir. 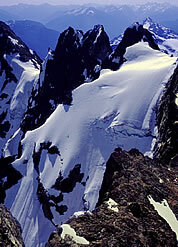 (The dihedral can be seen in the Beckey guide, between the 1972 Northeast Arête and the 1962 East Face of Northeast Towers routes.) The second pitch climbs an amazing finger crack on a slab and a handcrack on a headwall (5.8). Two pitches of moderate climbing in the dihedral (5.5) lead to the crux. The dihedral pulls a roof (5.10b R) and tops out on a ridge. Two fun pitches up cracks on slabby rock (5.8) finally join the Northeast Arête at about two-thirds height. Follow the fun, exposed arête to the Northeast Towers (mid-fifth-class). On June 28, 2004, Ross Peritore and I skied the Degenhardt Glacier in the Southern Picket Range. (An attempt a week and a half earlier with Jason Hummel and Ben Kaufman was aborted near the summit of Mount Degenhardt due to poor snow conditions.) We approached via Terror Creek and camped below the Chopping Block the first night. The next day, we made our way across Crescent Creek Basin and climbed a snow-filled couloir to the 7,100-foot col between Mount Terror and The Rake. The descent from the col featured steep, icy snow to 60 degrees. It was too early in the day for the snow to properly bake into corn, but Ross and I had wanted to descend early to give ourselves an opportunity to return to Crescent Creek Basin before nightfall. The angle eased after several hundred feet to open corn slopes in the 40-degree range. The crossing below the North Buttress of Mount Terror was easy, but the tongue of the upper Degenhardt Glacier had a somewhat imposing icefall. This icefall was the only real obstacle to climbing; there were no glacier-wide crevasses. The descent of the Degenhardt Glacier offered superb corn snow, ranging from near 50 degrees at the top to a 30-degree cruiser below the headwall. An exhilarating 2,300-foot descent, a short rappel, and a jaunt down to the bottom of the buttress left us with one last ascent to return to Crescent Creek. Ross led the climb to a col. The couloir into Crescent Creek provided a few more exciting turns where it was scarcely wider than a ski’s length. A couple hundred feet out of the couloir, we collapsed on some rocks to end a rigorous day. The next morning, we forsook alternate plans and headed home as swiftly as possible, narrowly missing an encounter with Colin Haley, who soloed the North Buttress of Mount Terror the day after we made our descents. 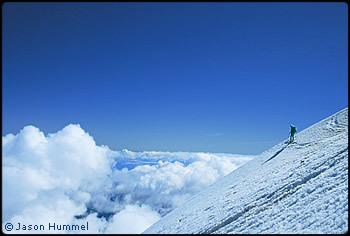 On July 4, 2004, Cyril Benda, Josh Hummel, and I skied the Northeast Face of Sherman Peak, a significant satellite of Mount Baker best viewed from the true summit jutting out of the steaming crater. While on a climb to ski the Park Glacier Headwall, we sauntered off-course in the fog and Sherman became our new destination. We easily climbed up a rocky cleaver to avoid gaping crevasses and finished the climb on the upper Talum Glacier. With a short break, we descended the Northeast Face, which consists of 40-plus-degree terrain, and found very good conditions. From a beautiful arête we transitioned to the face, where we were presented with nearly a vertical mile of skiing below on a never-ending moderate glacier, surrounded on all sides by pillow clouds nestled on one of the best mountains in the state. We found the experience very much worth the effort. In fact, extending a one-day push like ours into a three-day bash is highly recommended! The only difficulties we encountered were a bergschrund and a small rappel further down the glacier, both of which could be avoided by climbing in June or with the benefit of a portly winter snowpack. On July 12, 2004, Jordan Peters and I established another route on Peak 6800, having done an enjoyable first ascent of this peak two years ago. The route (III+ 5.10+ A1, 9 pitches) starts on the right-hand side of the obvious slab. The first pitch is the best climbing—splitter cracks on flawless granite (5.10). The rest of the climb involves many roofs, including a difficult traverse (5.10+ A1). I tried pulling a 5.11 overhanging offwidth, but gave up when my #4 Camalot pulled as I fell for the Nth time, so an exciting variation remains. For years, Fred Beckey’s Cascade Alpine Guide has described several fine routes on Burgundy Spire, but featured a photo of only the unclimbed East Face. On July 18, 2004, Mike Layton and I approached the spire to investigate a potential new route on this face. Mike claimed the first pitch, Bugaboo-like with its splitter cracks and white granite. The crux at pitch three required climbing steep 5.10 finger cracks filled with shag-carpet lichen with tortilla-chip lichen on the face. I began to aid the pitch after many free attempts. After I cleared the crux, a clap of thunder cut short our attempt. Retreat was immediate. We came back the next afternoon after a downpour subsided, this time armed with sleep and a base camp at Burgundy Col. Despite the threat of residual storms, we grabbed our stashed rack and switched leads, hoping to gain new ground and free the crux. At 3:30 p.m., I linked the first two pitches in 60m and cued Mike at a hanging belay below the crux. Mike cruised through cracks and flake systems to a new belay at the top of pitch three. We then simul-climbed 90m through a crack/chimney system cleaving the East Face. The quality of climbing was surprising. Mike topped out on the East Face on Burgundy’s north shoulder. I finished the last pitch via the Original Route (Beckey, Hane, and Parrott, 1953) and took it to the summit block at 9:00 p.m. We rappelled 800ft off the North Face to our camp, where cold PBR and Seagram’s Five-Star waited. The route’s first ascent was done in five pitches, clean and free, in six-and-a-half hours. We named it Action Potential (III 5.10) and gave it a Seagram’s * * *. The next morning, July 20, we started up an independent line 25ft left of Action Potential, to the original route’s first stance. Mike cast off right and up a beautiful finger/hand crack system. The line continued up, then left via an exciting traverse into an open-book seam, merging with the top of the third pitch from the previous day to establish a three-pitch variation, Beautiful Hand Crack (5.10). We rapped down the East Face and got our ropes stuck, forcing us to downclimb a rotten gulley and scuttle the ropes. Two days later, Tom Smith and I completed the second free ascent and retrieved the lines, also establishing a left-hand variation on the sixth pitch that is now the suggested route. A topo can be found on cascadeclimbers.com. Tom Smith and I spied a route up the northeast side of Burgundy Spire during the second free ascent of the East Face route Action Potential. Two days later, on July 24, 2004, we left SR-20 at 7:30 a.m. and approached the base of the wall. We started up the first pitch of an independent line 10ft right of Action Potential which shared that route’s first belay. We trundled some good belayer-slayers and cast off into a chimney that was succeeded by an amazing right-facing corner. The system continued via hand and finger cracks, as predicted by our previous scouting. Later, the route unexpectedly forced us to explore an interesting weakness that loomed above. We stood on a ledge below an open book seam leading to an amazing double-roofed hand-to-fist crack with changing corners. Lichen made free climbing impossible. Tom aided the seam and freed the difficult roofs at 5.10c/d. As the second, I was able to free the newly clean seam at 5.11. We continued to discover finger and hand crack systems made more exciting by great exposure and position. Tom led the last spicy pitch and topped out on Burgundy’s north shoulder, joining the Original Route for a final pitch to the summit block at 8:30 p.m. Our descent of the North Face went badly, with rockfall and several hung rappels. At 1:00 a.m., we finally reached the highway and the cold Pabst Blue Ribbon we'd left chilling in Early Winters Creek. With climbing up to 5.11 (or 5.10c/d A0) and seven pitches (5.8, 5.9, 5.8, 5.11, 5.9+, 5.9, 5.8), we named the route “Ultramega OK.” Two Lost Arrows were placed at the crux belay and one remains.